Our studies focus on squaraine dyes, in particular 2,4-bis[4-(N,N-diisobutylamino)-2,6-dihydroxyphenyl]squaraine (SQIB) (Figure 1), a small molecular model organic semiconductor blended with PC60BM ([6,6]-phenyl-C61-butyric acid methyl ester). 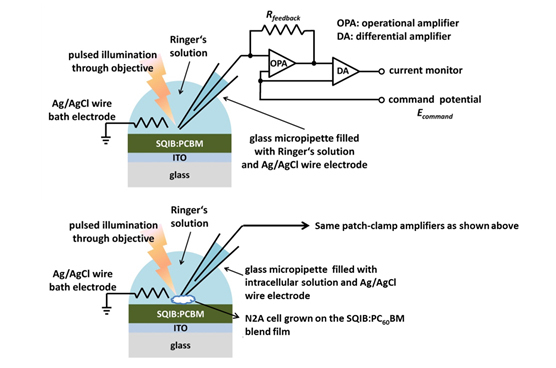 Figure 2. left: Schematic illustration of the N2A cells grown on the photoactive layer of the artificial photoreceptor, the photoactive layer consists of the SQIB:PC60BM (1:1) blend film, spincoated onto a conductive transparent indium tin oxide (ITO)/glass substrate; middle: Polarized light microscopy image of SQIB:PC60BM (1:1) birefringent, crystalline blend film with crossed polarizers; right: DIC (Differential Interference Contrast, Nomarski) microscopy image of N2A cells grown on SQIB:PC60BM (1:1) blend film (taken from Ref. 5). Figure 3. top: Sketch of transient photocurrent measurement within the electrolyte of floating samples. The circuit is closed between the patch microelectrode and the bath electrode, bottom: experimental setup for the photostimulation of a N2A cell grown on a SQIB:PC60BM blend film (taken from Ref. 5). Our research has a more fundamental character as it focuses on investigating the signaling pathway of the photostimulation rather than fabricating an implant. Several mechanisms at the organic semiconductor/electrolyte/cell interface can play a role here, among them photoelectrical stimulation by capacitive charging of the interface,2,3 photothermal stimulation6 or even photochemical reactions taking place between the organic semiconductor and the electrolyte. Due to the high annealing temperature the SQIB:PC60BM blend film shows a textured crystalline morphology (Figure 2, middle) which is beneficial for cell growth, even without an adhesion layer (Figure 2, right). The ineffectiveness of the photoeletrical stimulation so far demonstrates that we might need to change our device architecture in order to enhance the capacitive coupling effect, for example by introducing a dielectric insulating layer. Adjusting our experimental setups, by using higher light intensities or changing the illumination direction could also have an improving effect. We might even need to consider the possibility that merely one mechanistic pathway is not sufficient, but that it is rather a combination of mechanisms, e.g., photoelectrical and photothermal, that eventually activate ion channels. Changing the experimental procedures by prolonging the illumination time for example may reveal additional photothermal effects. Hadjinicolaou, A. E. et al. Prosthetic vision: devices, patient outcomes and retinal research. Clin. Exp. Optom. 98, 395-410 (2015). Ghezzi, D. et al. A polymer optoelectronic interface restores light sensitivity in blind retinas. Nat. Photonics. 7, 400-406 (2013). Gautam, V. et al. A polymer optoelectronic interface provides visual cues to a blind retina. Adv. Mater. 26, 1751-1756 (2014). Hestand, N. J. et al. Confirmation of the Origins of Panchromatic Spectra in Squaraine Thin Films Targeted for Organic Photovoltaic Devices. J. Phys. Chem. C. 119, 18964-18974 (2015). 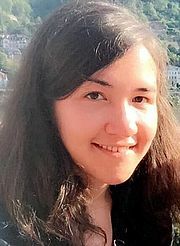 Abdullaeva, O. S. et al. 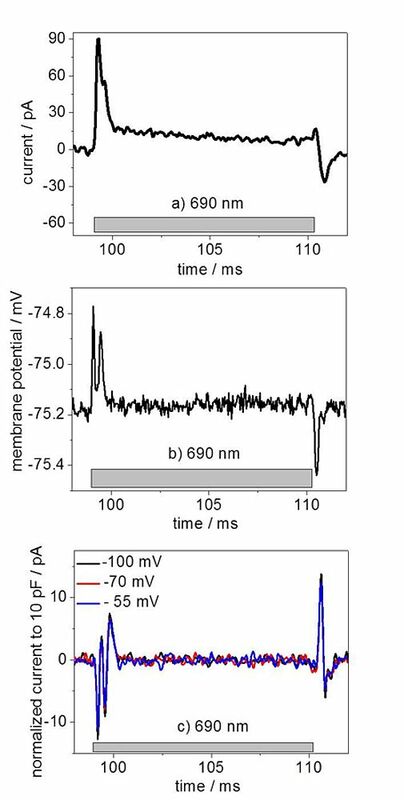 Photoelectrical Stimulation of Neuronal Cells by an Organic Semiconductor-Electrolyte Interface. Langmuir. 32, 8533-8542 (2016). Martino, N. et al. Photothermal cellular stimulation in functional bio-polymer interfaces. Sci. Rep. 5, 8911 (2015).